Description (from B&H): •	The Wave Panel from Tangent Devices is designed to incorporate the features and functionality of Tangent’s CP100 and CP200 series panels in an equally useful but more economical package. This compact unit features custom trackerballs that use non-contacting optical pickups and easy-to-read cool-blue OLED displays. 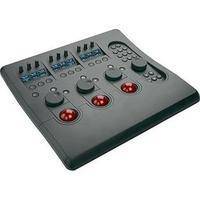 Numerous control interfaces include control knobs, label buttons, function buttons, master dials, and transport controls. 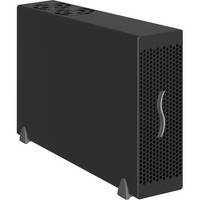 Description (from B&H): The Echo Express III-D Desktop Thunderbolt Expansion Chassis from Sonnet enables you to connect three compatible full-size professional video capture, audio interface and other special-purpose cards to your iMac, Mac mini, MacBook Air, MacBook Pro or the new Mac Pro with a Thunderbolt port. The Echo Express III-D integrates a universal 300W power supply and includes a 75W auxiliary power connector for cards that require supplementary power. The expansion chassis is eco-friendly as it automatically powers off when the connected computer is powered off or in sleep mode. The use of larger, slower-spinning fans in the Echo Express III-D reduces noise. Two Thunderbolt ports support daisy chaining of up to six devices to a single port on your computer. Description (from B&H): •	HP StoreEver LTO Ultrium Tape Drives represent six-generations of LTO technology capable of storing up to 6.25 TB per cartridge, with HP TapeAssure for manageability, hardware data encryption, HP StoreOpen with LTFS for ease of use at an unprecedented performance. With HP TapeAssure customers can be confident that their data is safe by monitoring drive and media utilization, operational performance and life/health information for drive and media. 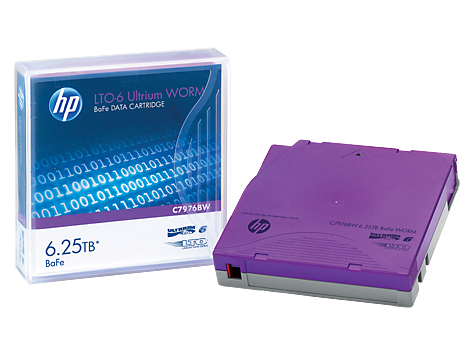 Data hardware encryption using AES 256-bit provides easy-to-enable security to protect the most sensitive data and prevent unauthorized access of tape cartridges. Linear Tape File System (LTFS) is an open format for storing data on tape that makes LTO-5 and 6 tapes self-describing and file-based. Capable of data transfer rates up to 400 MB/sec, HP’s exclusive Data Rate Matching further optimizes performance by matching host system speed to keep drives streaming, thus enabling the fastest tape performance. Description (from B&H):•	Exhaustively tested, HP LTO Ultrium cartridges meet all your demands for maximum reliability when restoring data, offering high storage density, ease of management and scalable storage and backup performance. Covering six generations of capacity – LTO-1 (200 GB), LTO-2 (400 GB), LTO-3 (800 GB), LTO-4 (1.6 TB), LTO-5 (3 TB), LTO-6 (6.25 TB) – and with transfer speeds of up to 1.4 TB/hr for LTO-6, there is a platform for every need and budget. From LTO-3 onwards, LTO Ultrium WORM cartridges enable the creation of compliant, permanent and tamperproof archives. From LTO-4 onwards, secure AES-256 encryption provides even higher levels of data security and compliance with the most stringent industry regulations to prevent unauthorized data access. From LTO-5 onwards, LTO Ultrium Linear Tape File System makes using tape as easy, flexible, portable and intuitive as using other removable and sharable media, such as a USB drive. Description (from B&H):The ExpressSAS 6 Gbps SAS/SATA PCIe 2.0 Host Bus Adapter (8 External Ports) from ATTO Technologyprovides blazing-fast 6-Gbps performance at 600Mbps per port. By utilizing a serial, point-to-point architecture, in addition to PCIe 2.0 bus technology, ExpressSAS is engineered for demanding IT and digital media applications which require more performance than 3-Gb SAS/SATA can provide. The ExpressSAS PCIe 2.0 Host Bus Adapter features eight external ports and allows connections to 256 end-point devices.